Let's do Fall right this year. That means lots of apples and pumpkins. So let's start with apples this week and then I'm going to have an awesome pumpkin recipe coming up next. 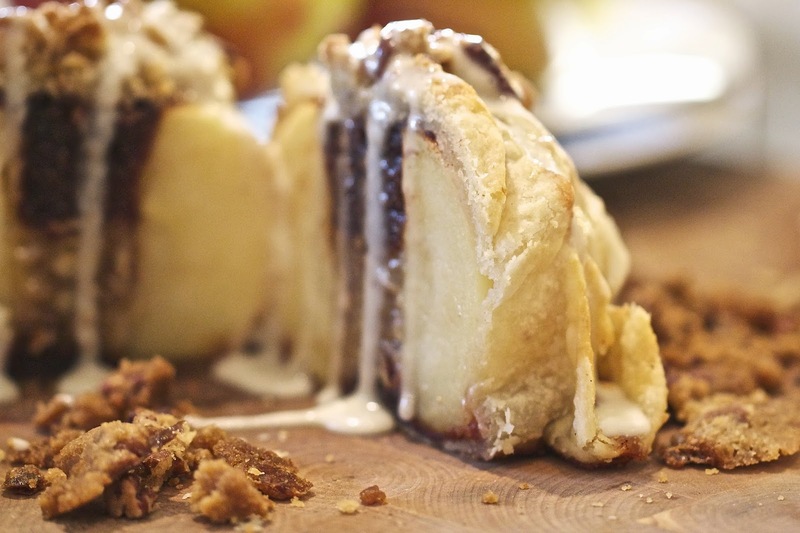 We're going to take an apple and make it anything but healthy. As in, even though there's still some fruit in this, there's no way it can be described as anything but, hide in your closet and eat two of them and love every second of it, indulgence. I started off with some beautiful Honey Crisp apples which every Minnesotan knows and loves. 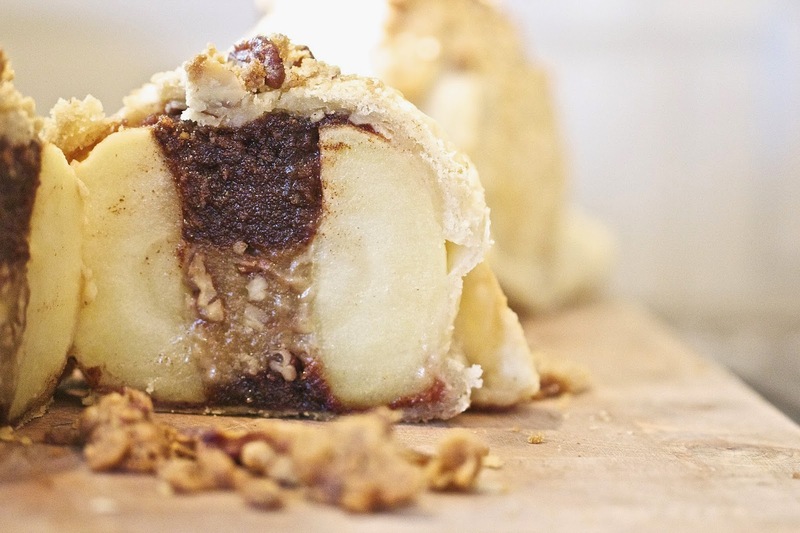 You can use any baking apple but you won't get a variety that holds up and tastes so good even when baked. The apples are peeled and cored to make room for all of the goodies we're going to pack inside them. If you've got an apple corer, it will make the job a bit easier, otherwise use a sharp knife to carefully cut out the core. I cut a cone from both ends and then sliced down through the apple through to the other side around the core and then pushed it out the other end. We're going to use two mixtures for flavor in these apples. The first is a combination of cinnamon, sugar, nutmeg and bread crumbs. It uses a lot of cinnamon, but don't skimp here. The second combination is the pecan streusel. If you don't like pecans, use them anyway. They provide a great crunch and flavor to the dumpling. 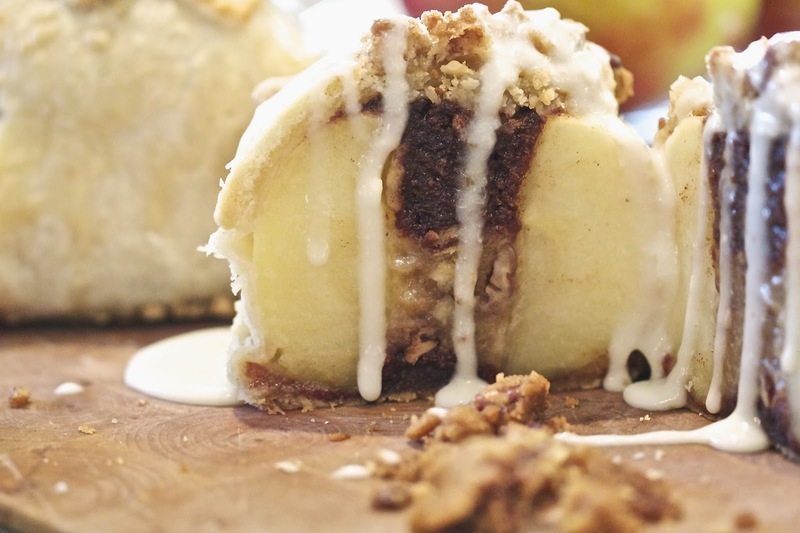 The apple is placed on a bed of the cinnamon mixture, then the core is packed with both the pecan streusel and the cinnamon mixture to overflowing. Yeah, it might be overboard but you'll appreciate it later. 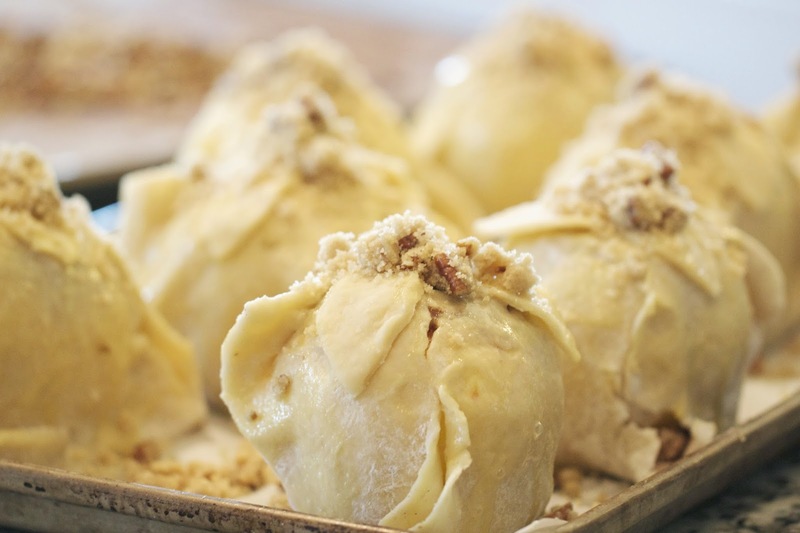 The whole apple is then wrapped in puff pastry to hold in all that flavor and creates a beautiful golden crust. When baking them, you may be tempted to bake it longer than needed. I like to still have some good structure and crisp to my apples in pies etc, so the instructions below account for that. It's best that way, trust me. And if all that wasn't enough, after it's baked it's then drizzled with frosting. Like I already said, it's indulgent. But now you're intrigued and your taste buds are watering so you're going to go make it yourself. And, so am I. 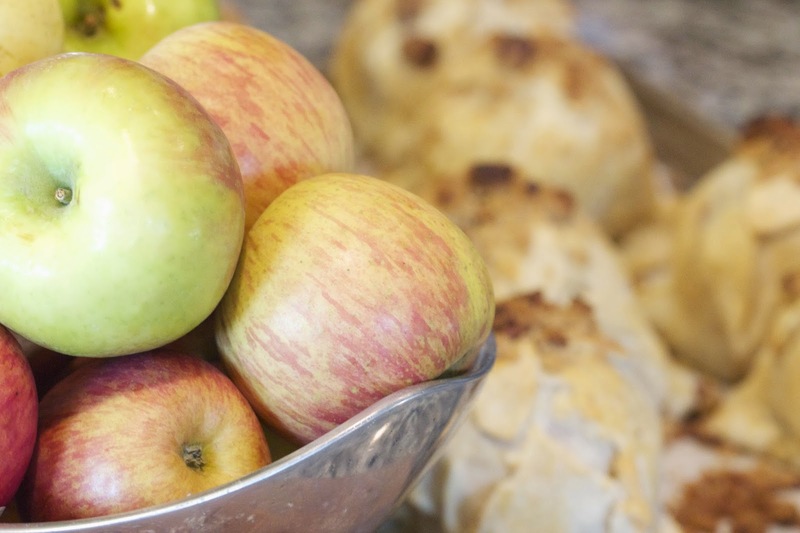 Roll out the puff pastry to approximately 8x8 squares or large enough to wrap the apple. Combine the sugar, breadcrumbs, cinnamon and nutmeg in a medium bowl, set aside. In a separate bowl, combine the pecans, brown sugar, flour and butter and stir with a fork until combined. It should be a crumbly mixture. Place 1 tablespoon of the cinnamon mixture in the center of each square. 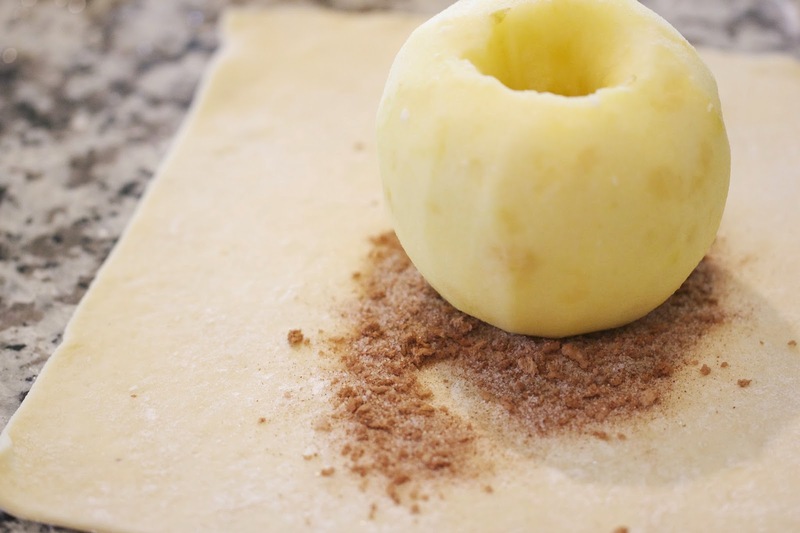 Place the cored apple over the cinnamon mixture. Fill the apple core approximately half way with the pecan streusel and then the remaining half with the cinnamon mixture. Pull up the four corners of the pastry and seal at the top and sides. 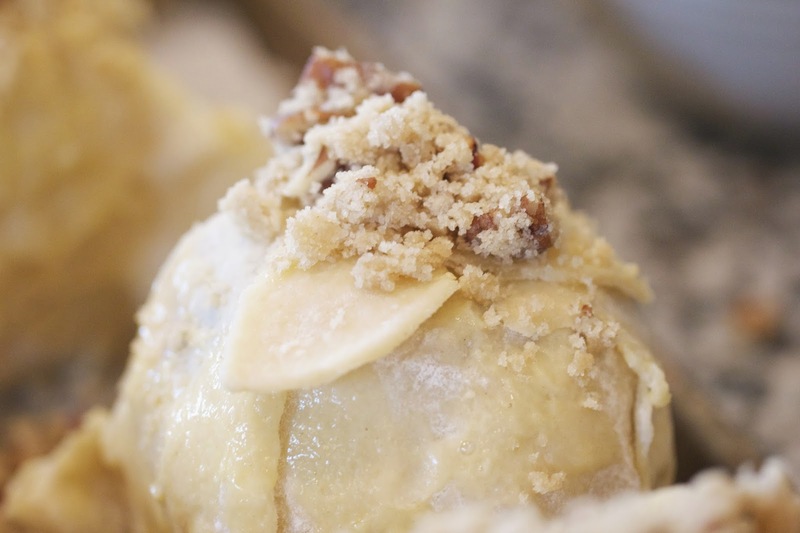 Brush the pastry with a beaten egg and sprinkle the reamaining streusel over the top of the apples. 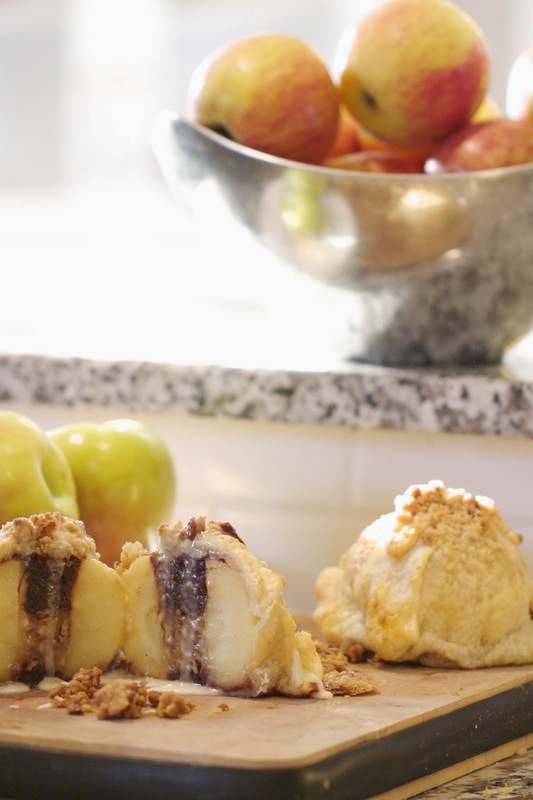 Place the apples on a parchment lined sheet pan and place in the oven. Cook for 15 minutes and then reduce the temperature to 350 degrees and cook for an additional 25 minutes. 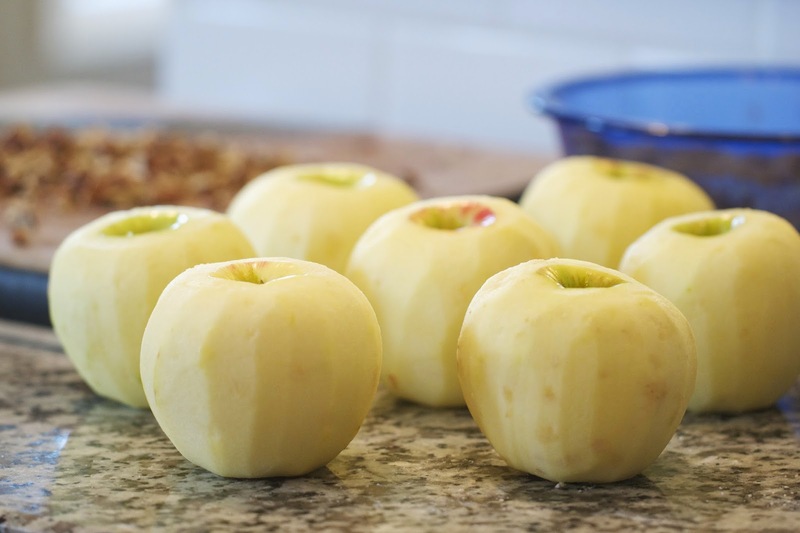 Cover the apples with tinfoil once they become golden brown. Combine the confectioners' sugar, vanilla, milk and butter in a small bowl and stir to combine. Drizzle over apples and serve. The best apple slicer is a compact, multi functional gadget. Blades are sharp which is wonderful- you can easily slice tomatoes with this. Making salads and salsas are no mess; no fuss no waste with the Vremi corer. The size of a mango pit varies, but with the right positioning, easy cleans up too. Vremi really thinks of convenience and use when making their products.